The 1988 edition of the TYCO Catalog is another full color publication and like the 1987 edition is bound with a spine. 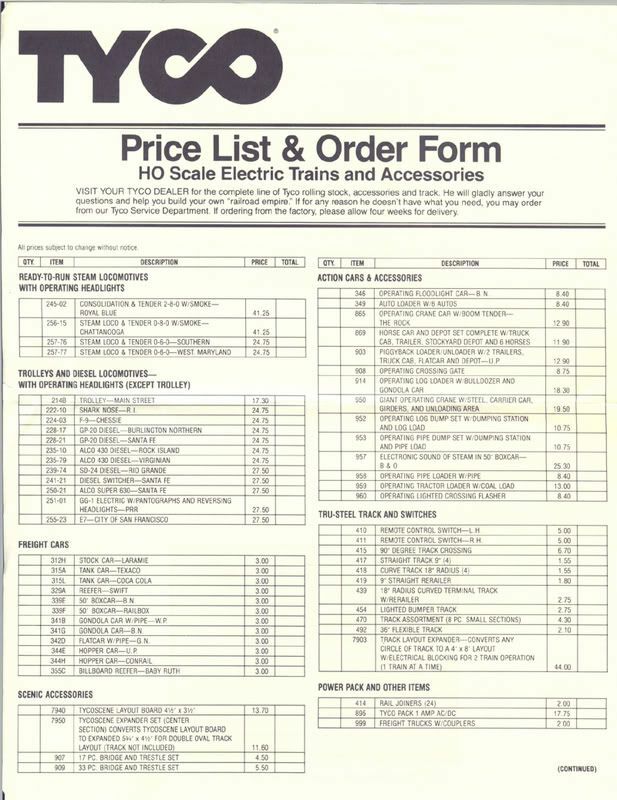 The Electric Trains portion of the '88 catalog opens with a pair of Turbo Train offerings, Turbo Express (No.7424) and Turbo Train (No.7427) spread across pages 76 and 77. Next up is the new-that-year Rock Island Shark led Overnight Freight train set (No.7401) and the Santa Fe 72 (No.7414) also shown with a NEW burst logo. TYCO's Chattanooga (No.7416) and the USA Express (No.7420) are next in the 1988 catalog. 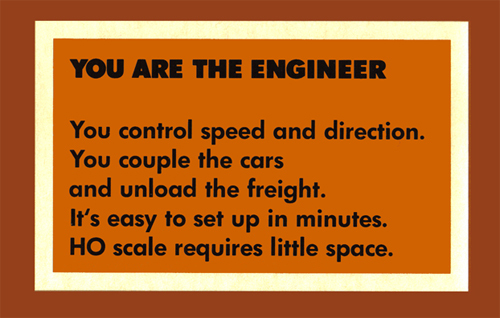 The Railroad Empire (No.7429) is the final TYCO train set shown that year and it shares a two page spread with Train Accessories. 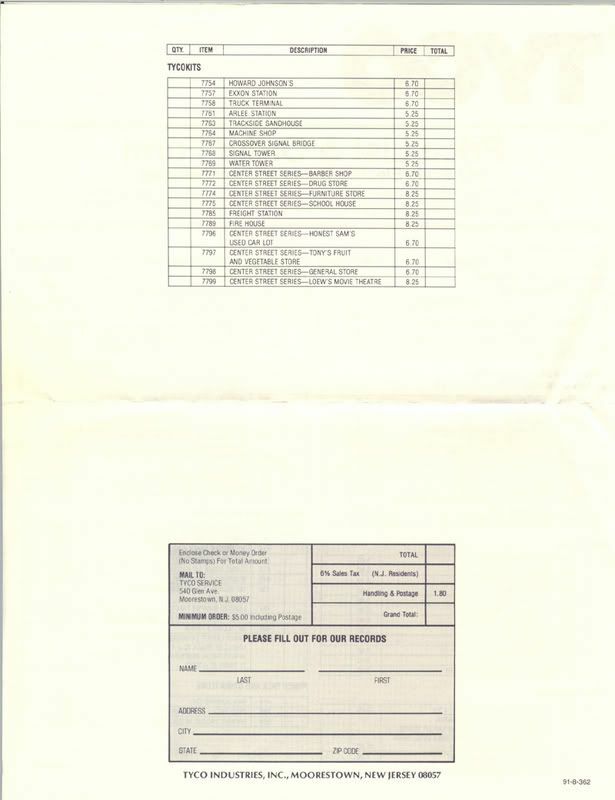 TYCO's Train Accessories section for 1988 includes the Horse Car and Depot Set (No.869); Giant Operating Crane (No.950); Piggyback Loader and Unloader (No.903); Track Layout Expander (No.7903B); TYCOPack (No.895); the Tru-Steel Track offerings; Bridge & Trestle Set (No.909); TYCOSCENE Layout Board (No.7940); Turbo Train Loop Track Set (No.7901); Crane Car with Boom Tender (No.865); Crossing Gate (No.908); Operating Floodlight Car (No.346); Electronic Sound of Steam in 50' B&O Box Car (No.957). TYCOKits cataloged for 1988 include Furniture Store (No.7774B); Drug Store (No.7772B); Fruit Store (No.7797B); Barber Shop (No.7771B); Used Car Lot (No.7796B); School House (No.7775B); General Store (No.7798B); Movie Theatre (No.7799B); Pizza Hut (No.7724B); Burger King (No.7725B); Baskin Robbins (No.7731B); 7UP Plant (No.7727B); Howard Johnsons (No.7754B); Freight Station (No.7785B); Crossover Signal Bridge (No.7767); Machine Shop (No.7764); Firehouse (No.7789); Trackside Sand House (No.7763); Signal Tower (No.7768); Water Tower (No.7769); Truck Terminal (No.7768B); Exxon Station (No.7757B); Arlee Station (No.7761). TYCO pictures four Steam Locomotives in its 1988 catalog. The Royal Blue Consolidation 2-8-0 with Tender (No.245-02); Chattanooga 0-8-0 with Tender and Smoke (No.256-15); and a pair of 0-6-0 Steam Locos with Tenders: Southern (No.257-76) and Western Maryland (No.257-77). The three-unit Turbo Train (No.7900) is listed as a separate locomotive offering. Diesel Locomotives include a Rock Island Shark Nose (No.222-10); Chessie System F-9A (No.224-03); a Burlington Northern GP-20 (No.228-170; the red and silver Santa Fe GP-20 (No.228-21); Virginian C430 (No.235-79); and a lone Super630 the Santa Fe (No.250-21). 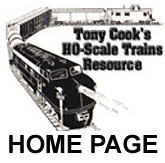 TYCO's Freight Cars section contains a dozen examples including the Laramie Stock Car (No.312H); Santa Fe 50' Box Car (No.339A); Great Northern Skid Flat with Pipes (No.342D); Texaco Tank Car (No.315A); Union Pacific Gondola with Culvert Pipe (No.341B); BN 50' Box Car (No.339E); Union Pacific Hopper (No.344E); Conrail Hopper (No.344H); Coca-Cola Tank Car (No.315L); Swift Reefer (No.329A); BN Gondola with Barrels (No.341G); Baby Ruth Billboard Reefer (No.355C).